Everything Eatherton: Merry Christmas Eve & Happy 5 Months to Cole! On Christmas Eve, Cole Joseph turned 5 months old. It was a very busy day at the Eatherton's, as we were preparing to have our California family (the Kirkpatricks and the Kalvarias) over for a non holiday-specific and not at all religious Dec. 24th party. To add to what was already an exciting day, Cole decided to roll over for the very first time all by himself! If you haven't already seen it, you can watch the video here. Even though the guests all departed by 8pm, a good time was had by all. This Christmas baby is ready for bed! Clothing Size- This boy is flying though his clothes at warp speed! He is officially too big for his 3-6 month clothes. He can fit into some 6 month onesies, but not pjs (poor baby has a little blister on his pinky toe because the footies on his 6 month jammies are too small!) He has just started wearing 9 month clothes from Carter's. I cannot wrap my head around this! 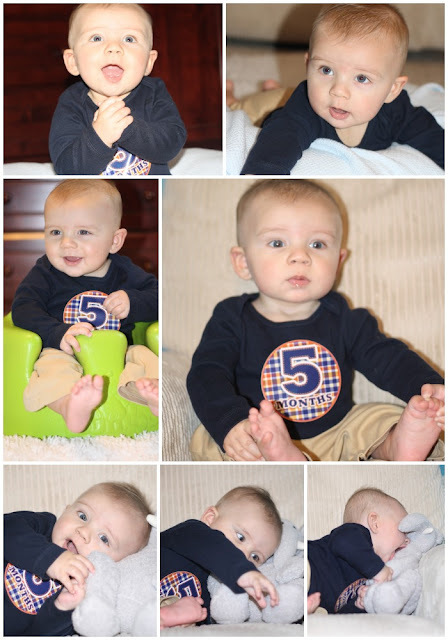 Brady was in 0-3 month clothes until he was 5 months. We have sadly moved from size 2 Swaddlers to size 3 Pampers Cruisers. He isn't cruising anywhere yet, but if he decides to up and crawl, well, I guess his diaper will be ready! Teeth- Not a one, but the drool is out of control. I swear we go through 5 bibs a day. Cole will chew on pretty much anything he can get his chubby little hands on, but his two favorite chew toys are his squeaky Sofie and Mom's finger (go figure). I'm thinking about getting some of those Chewbeads necklaces... anyone ever tried one of those? Thoughts?? Sleeping Habits- Sleep is still a delicate subject in the Eatherton household. We had started getting into a better rhythm with Cole just before our trip to Chicago, but when we returned the bottom fell out. He started waking again multiple times throughout the night and his naps went back to 30 minutes. We were all miserable... again. So we decided to spend the 4 day weekend sleep training again, which unfortunately, produced a bit of crying (Cole & Mom). But he's slowly adjusting back to his "routine" and we hope to be down to one night feeding only very soon! Fingers crossed. Feeding- Sadly, we stopped breastfeeding Thanksgiving weekend, so Cole is 100% formula fed now (Similac Sensitive). It was just not working for either of us. Since we made the switch to formula, Cole and I are both much happier, so I think that it was the right decision. Four months is a good amount of time and I'm glad we were able to make it that long. Daily Activities- Cole is taking 3 naps a day, which doesn't leave much time for activities during the day. If he's not eating, sleeping, or pooping, he enjoys gnawing on toys in his exersaucer, watching his big brother and Tinley play, and pinching the tags on all of his stuffed animals. He also gets a kick out of pulling Mom's hair! Mobility- He started rolling over from his back to his belly on Christmas Eve and hasn't stopped since (though he's only rolling over one way). We wonder how long it will take before this creates a NEW sleep problem. Vocal Skills- Cole makes a lot of gurgling sounds (goos/gaas) but he's proving to be the strong but silent type. If you catch him at the right time, he will babble a bit for you, but he's mostly pretty quiet. He is also very stingy with the laughs! He'll smile and give you a few giggles, but he has still not done a full out belly laugh. I am anxiously awaiting that day!